From Amma Unavagam to ID in 24 hours.. Read on.. I am generally a sucker for combo offers. I go for mini-tiffin, Thali, buffet types as I believe you can do paisa-vasool for the money you shell out. It is customary for us to go to iD whenever we go for movies at Sathyam complex. We particularly like the coffee and onion rava dosa at this Restaurant. Raghav noticed this tent on our table and I couldn't resist. This 'Eat all you can!' 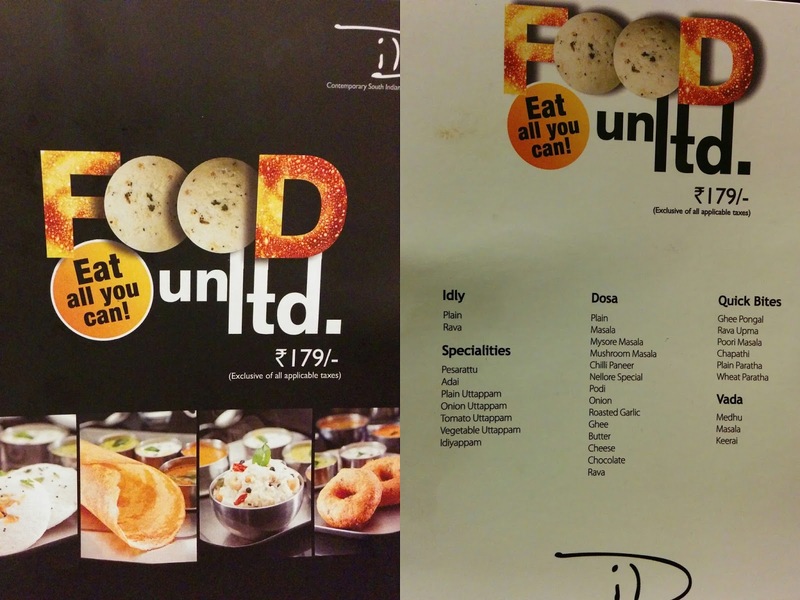 had almost everything from their main menu, barring my favorites Onion Rava Dosa and coffee. But at Rs. 179, it was a good deal and we gobbled all we could and ended up missing the first 5 minutes of the movie, Interstellar.